Extra-articular fractures are generally treated in a closed manner. Exceptions include fractures of the sustentaculum tali with displacement of more than 2 mm, posterior avulsion fractures, and significant fractures of the calcaneal body. Zhang et al performed a meta-analysis of seven randomized controlled trials (N = 908) comparing operative treatment of displaced intra-articular calcaneal fractures with nonoperative treatment. Although correctly performed surgery yielded improvements in shoe wear and gait patterns, these benefits were countered by increases in complications (prmarily wound-related). Treatment groups did not differ significantly with respect to American Orthopaedic Foot and Ankle Society (AOFAS) score, Short Form (SF)-36, return to work, rate of subsequent talar fusion, or incidence of reflex sympathetic dystrophy. Nonoperative treatment of calcaneus fractures requires the cooperation of a multidisciplinary team involving an orthotist, a physical therapist, an occupational therapist, and a surgeon familiar with the pattern of injury involved. Closed reduction may be attempted by plantarly displacing both the forefoot and the hindfoot to reverse the mechanism of injury, which allows for elevation of the posterior facet. However, this approach rarely results in durable maintenance of the reduction. Many authors recommend short leg casting and no weightbearing for 2 weeks, followed by range-of-motion (ROM) exercises. Progressive weightbearing should begin at 8 weeks, with full weightbearing by 12 weeks. Calcaneus fractures. Avulsion-type fracture of calcaneus, sustained when patient fell 6 ft from ladder onto solid ground. Because of distraction of fracture fragments, injury was treated with open reduction and internal fixation. Calcaneus fractures. Status post open reduction and internal fixation. ORIF of a calcaneus fracture is made difficult by the complex anatomy, the presence of soft cancellous bone (which is not amenable to screw fixation), and the high incidence of postoperative wound infection and breakdown. Most reports suggest that the functional outcome is related to the accuracy of the subtalar joint reduction, the restoration of normal heel morphology, the status regarding subfibular decompression, and the implementation of postoperative measures to decrease swelling. Preoperatively, a comprehensive physical examination must be undertaken. One should exercise care to avoid overlooking additional injuries of the musculoskeletal system. Some 10-15% of trauma patients with a fracture of the calcaneus have a concomitant spinal injury. A full history, including documentation of preexisting medical conditions such as diabetes or vascular disease, should not be unnecessarily delayed. A multidisciplinary team consisting of the surgeon, the anesthesiologist, and the physician who is providing preoperative clearance should all be involved in planning the procedure (if indicated). Knowledge of the relevant anatomy is important, as is having clear and comprehensive images of the injury. Thorough imaging allows for careful determination of the surgical approach and for planning of a staged procedure, if necessary. The timing of surgery is an important factor in determining surgical success, as measured by long-term functional outcomes. Ideally, surgery should occur within 3 weeks after injury. This period allows for any swelling and fracture blisters to resolve completely, but the procedure is still sufficiently early to prevent premature healing and coalescence of the fracture fragments. In the absence of fracture blisters, the return of normal skin wrinkling is an indication that significant swelling has resolved and operative intervention may proceed. Compared with open procedures, closed reduction with percutaneous fixation has a lower risk of wound complications, a shorter operating time, and more rapid healing because the soft tissue is handled less. [41, 42, 43] This approach is indicated in patients with significant comorbidities, soft-tissue compromise or impaired healing, or true tongue-type fracture patterns. The goals of this approach include improvement of heel alignment and reduction of the posterior facet. Unfortunately, the limited exposure that this technique affords sometimes prevents adequate reduction and fixation of the calcaneal injury. If anatomic joint reduction is sought, ORIF may be a preferred option. The most popular incision for exposure during ORIF of calcaneus fractures is an extensile lateral approach. This approach allows the surgeon to visualize the entire fracture. It also allows complete reduction from the tuberosity to the anterior process and the calcaneocuboid joint. In addition, this approach permits indirect reduction of the medial wall and the sustentaculum. The extensile lateral approach should include a full-thickness skin flap. Gentle tissue handling is a must, and adequate wound closure is equally important. Flap closure that avoids excessive tension on the skin is critical to prevent skin necrosis. The use of thin plates in calcaneal fixation has significantly addressed the issue of excessive skin tension, hardware prominence, and subsequent wound breakdown. Zwipp et al described the use of a locking nail system for internal fixation of 106 displaced intra-articular calcaneal fractures (15 percutaneously and 91 via a sinus tarsi approach), in an effort to reduce the complications associated with extensile approaches. They noted a low incidence of soft-tissue complications (superficial wound edge necrosis, 1.9%; deep infection, 0.9%), improved Bohler angles (from 7.3º to 31.2º at 3 months), and good AOFAS scores (89.5 at 6 months and 92.6 at 12 months). They further noted that the locking nail was not designed to accomplish reduction and that joint congruity and calcaneal shape must be restored before nails are inserted. A small suction drain is frequently used after ORIF. This drain is typically removed when less than 10 mL of drainage fluid is collected over 8 hours. Postoperatively, the foot is elevated with the ankle in the standard neutral position of a 90° angle between the foot and the tibia. This position is maintained for up to 72 hours to reduce postoperative swelling. Early ROM exercises are encouraged after the surgical incision has begun healing, usually 10-12 days after surgery. A well-fitting orthosis is provided for comfort and to prevent gastrocnemius-soleus contracture. Sutures are removed at 2-3 weeks, but weightbearing is delayed for up to 12 weeks, depending on the original degree of comminution and the subsequent rigidity of the fixation. Supervised physical therapy may be of substantial benefit, both during the nonweightbearing period and during the active weightbearing recovery phase. Wells C. Fractures of the heel bones in early and prehistoric times. Practitioner. 1976 Aug. 217(1298):294-8. [Medline]. Rammelt S, Sangeorzan BJ, Swords MP. Calcaneal Fractures - Should We or Should We not Operate?. Indian J Orthop. 2018 May-Jun. 52 (3):220-230. [Medline]. [Full Text]. Bohler L. Diagnosis, pathology, and treatment of fractures of the calcaneus. J Bone Joint Surg. 1931. 13:75-89. Essex-Lopresti P. The mechanism, reduction technique, and results in fractures of the os calcis, 1951-52. Clin Orthop Relat Res. 1993 May. 3-16. [Medline]. Rowe CR, Sakellarides H, Freeman P. Fractures of os calcis - a long-term follow-up study one hundred forty-six patients. JAMA. 1963. 184:920-923. Lindsay WR, Dewar FP. Fractures of the os calcis. Am J Surg. 1958 Apr. 95(4):555-76. [Medline]. Rubino R, Valderrabano V, Sutter PM, Regazzoni P. Prognostic value of four classifications of calcaneal fractures. Foot Ankle Int. 2009 Mar. 30(3):229-38. [Medline]. Schepers T, van Lieshout EM, Ginai AZ, Mulder PG, Heetveld MJ, Patka P. Calcaneal fracture classification: a comparative study. J Foot Ankle Surg. 2009 Mar-Apr. 48(2):156-62. [Medline]. Richter M, Kwon JY, DiGiovanni CW. Foot injuries. Browner B, Jupiter J, Krettek C, Anderson PA, eds. Skeletal Trauma: Basic Science, Management, and Reconstruction. 5th ed. Philadelphia: Elsevier Saunders; 2015. Vol 2: 2251-388. Cohen MM. Calcaneal fractures. Banks AS, Downey MS, Martin DE, Miller SJ, eds. McGlamry's Comprehensive Textbook of Foot and Ankle Surgery. 3rd ed. Philadelphia: Lippincott Williams & Wilkins; 2001. Vol 2: 1819-1863. Juliano P, Myerson MS. Fractures of the hindfoot. Myerson MS, ed. Foot and Ankle Disorders. Philadelphia: Saunders; 2000. Vol 2: 1297-1340. Sanders R, Fortin P, DiPasquale T, Walling A. Operative treatment in 120 displaced intraarticular calcaneal fractures. Results using a prognostic computed tomography scan classification. Clin Orthop Relat Res. 1993 May. 87-95. [Medline]. Crosby LA, Fitzgibbons T. Intraarticular calcaneal fractures. Results of closed treatment. Clin Orthop Relat Res. 1993 May. 47-54. [Medline]. Sanders RW, Rammelt S. Fractures of the calcaneus. Coughlin MJ, Saltzman CL, Anderson RB, eds. Mann's Surgery of the Foot and Ankle. 9th ed. Philadelphia: Elsevier Saunders; 2014. Vol 2: 2041-100. Barei DP, Bellabarba C, Sangeorzan BJ, Benirschke SK. Fractures of the calcaneus. Orthop Clin North Am. 2002 Jan. 33 (1):263-85, x. [Medline]. Bridgman SA, Dunn KM, McBride DJ, Richards PJ. Interventions for treating calcaneal fractures. Cochrane Database Syst Rev. 2000. (2):CD001161. [Medline]. Buckley RE, Meek RN. Comparison of open versus closed reduction of intraarticular calcaneal fractures: a matched cohort in workmen. J Orthop Trauma. 1992. 6(2):216-22. [Medline]. Richards PJ, Bridgman S. Review of the radiology in randomised controlled trials in open reduction and internal fixation (ORIF) of displaced intraarticular calcaneal fractures. Injury. 2001 Oct. 32(8):633-6. [Medline]. Cotton FJ, Henderson FF. Results of fractures of the os calcis. Am J Orthop Surg. 1916. 14:290. Zhang T, Su Y, Chen W, Zhang Q, Wu Z, Zhang Y. Displaced intra-articular calcaneal fractures treated in a minimally invasive fashion: longitudinal approach versus sinus tarsi approach. J Bone Joint Surg Am. 2014 Feb 19. 96(4):302-9. [Medline]. Schuberth JM, Cobb MD, Talarico RH. Minimally invasive arthroscopic-assisted reduction with percutaneous fixation in the management of intra-articular calcaneal fractures: a review of 24 cases. J Foot Ankle Surg. 2009 May-Jun. 48(3):315-22. [Medline]. Grala P, Twardosz W, Tondel W, Olewicz-Gawlik A, Hrycaj P. Large bone distractor for open reconstruction of articular fractures of the calcaneus. Int Orthop. 2009 Oct. 33 (5):1283-8. [Medline]. Dhillon MS, Gahlot N, Satyaprakash S, Kanojia RK. Effectiveness of MIS technique as a treatment modality for open intra-articular calcaneal fractures: A prospective evaluation with matched closed fractures treated by conventional technique. Foot (Edinb). 2015 Sep. 25 (3):134-40. [Medline]. Eckstein C, Kottmann T, Füchtmeier B, Müller F. Long-term results of surgically treated calcaneal fractures: an analysis with a minimum follow-up period of twenty years. Int Orthop. 2016 Feb. 40 (2):365-70. [Medline]. Broden B. Roentgen examination of the subtaloid joint in fractures of the calcaneus. Acta Radiol. 1949. 31:85. Sanders R. Intra-articular fractures of the calcaneus: present state of the art. J Orthop Trauma. 1992. 6(2):252-65. [Medline]. Thermann H, Krettek C, Hüfner T, Schratt HE, Albrecht K, Tscherne H. Management of calcaneal fractures in adults. Conservative versus operative treatment. Clin Orthop Relat Res. 1998 Aug. 107-24. [Medline]. López-Oliva F, Forriol F, Sánchez-Lorente T, Sanz YA. Treatment of severe fractures of the calcaneus by reconstruction arthrodesis using the Vira System: Prospective study of the first 37 cases with over 1 year follow-up. Injury. 2010 Aug. 41(8):804-9. [Medline]. Varela CD, Vaughan TK, Carr JB, Slemmons BK. Fracture blisters: clinical and pathological aspects. J Orthop Trauma. 1993. 7(5):417-27. [Medline]. Thornton SJ, Cheleuitte D, Ptaszek AJ, Early JS. Treatment of open intra-articular calcaneal fractures: evaluation of a treatment protocol based on wound location and size. Foot Ankle Int. 2006 May. 27(5):317-23. [Medline]. Buckley R, Tough S, McCormack R. Operative compared with nonoperative treatment of displaced intra-articular calcaneal fractures: a prospective, randomized, controlled multicenter trial. J Bone Joint Surg Am. 2002 Oct. 84-A(10):1733-44. [Medline]. Besch L, Waldschmidt JS, Daniels-Wredenhagen M, Varoga D, Mueller M, Hilgert RE, et al. The treatment of intra-articular calcaneus fractures with severe soft tissue damage with a hinged external fixator or internal stabilization: long-term results. J Foot Ankle Surg. 2010 Jan-Feb. 49(1):8-15. [Medline]. Zhang W, Lin F, Chen E, Xue D, Pan Z. Operative Versus Nonoperative Treatment of Displaced Intra-Articular Calcaneal Fractures: A Meta-Analysis of Randomized Controlled Trials. J Orthop Trauma. 2016 Mar. 30 (3):e75-81. [Medline]. Degan TJ, Morrey BF, Braun DP. Surgical excision for anterior-process fractures of the calcaneus. J Bone Joint Surg Am. 1982 Apr. 64(4):519-24. [Medline]. Pozo JL, Kirwan EO, Jackson AM. The long-term results of conservative management of severely displaced fractures of the calcaneus. J Bone Joint Surg Br. 1984 May. 66(3):386-90. [Medline]. Wagstrom EA, Downes JM. Limited Approaches to Calcaneal Fractures. Curr Rev Musculoskelet Med. 2018 Jul 11. [Medline]. Benirschke SK, Sangeorzan BJ. Extensive intraarticular fractures of the foot. Surgical management of calcaneal fractures. Clin Orthop Relat Res. 1993 Jul. 128-34. [Medline]. Burdeaux BD. Fractures of the calcaneus: open reduction and internal fixation from the medial side a 21-year prospective study. Foot Ankle Int. 1997 Nov. 18(11):685-92. [Medline]. Lakstein D, Bermant A, Shoihetman E, Hendel D, Feldbrin Z. The Posterolateral Approach for Calcaneal Fractures. Indian J Orthop. 2018 May-Jun. 52 (3):239-243. [Medline]. [Full Text]. Schepers T, Vogels LM, Schipper IB, Patka P. Percutaneous reduction and fixation of intraarticular calcaneal fractures. Oper Orthop Traumatol. 2008 May. 20(2):168-175. [Medline]. Walde TA, Sauer B, Degreif J, Walde HJ. 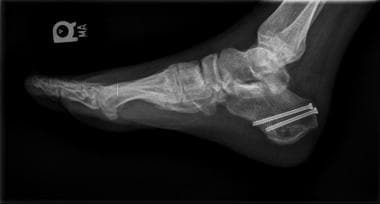 Closed reduction and percutaneous Kirschner wire fixation for the treatment of dislocated calcaneal fractures: surgical technique, complications, clinical and radiological results after 2-10 years. Arch Orthop Trauma Surg. 2008 Jun. 128(6):585-591. [Medline]. DeWall M, Henderson CE, McKinley TO, Phelps T, Dolan L, Marsh JL. Percutaneous reduction and fixation of displaced intra-articular calcaneus fractures. J Orthop Trauma. 2010 Aug. 24(8):466-72. [Medline]. Rammelt S, Gavlik JM, Barthel S. The value of subtalar arthroscopy in the management of intra-articular calcaneus fractures. Foot Ankle Int. 2002 Oct. 23(10):906-16. [Medline]. Park CH, Yoon DH. Role of Subtalar Arthroscopy in Operative Treatment of Sanders Type 2 Calcaneal Fractures Using a Sinus Tarsi Approach. Foot Ankle Int. 2018 Apr. 39 (4):443-449. [Medline]. Cavadas PC, Landin L. Management of soft-tissue complications of the lateral approach for calcaneal fractures. Plast Reconstr Surg. 2007 Aug. 120(2):459-66; discussion 467-9. [Medline]. Zwipp H, Paša L, Žilka L, Amlang M, Rammelt S, Pompach M. Introduction of a New Locking Nail for Treatment of Intraarticular Calcaneal Fractures. J Orthop Trauma. 2016 Mar. 30 (3):e88-92. [Medline]. Reddy V, Fukuda T, Ptaszek AJ. Calcaneus malunion and nonunion. Foot Ankle Clin. 2007 Mar. 12(1):125-35. [Medline]. Li S. Wound and Sural Nerve Complications of the Sinus Tarsi Approach for Calcaneus Fractures. Foot Ankle Int. 2018 May 1. 1071100718774808. [Medline]. Amani A, Shakeri V, Kamali A. Comparison of calcaneus joint internal and external fractures in open surgery and minimal invasive methods in patients. Eur J Transl Myol. 2018 Apr 24. 28 (2):7352. [Medline]. [Full Text]. Zeng Z, Yuan L, Zheng S, Sun Y, Huang F. Minimally invasive versus extensile lateral approach for sanders type II and III calcaneal fractures: A meta-analysis of randomized controlled trials. Int J Surg. 2018 Feb. 50:146-153. [Medline]. Potter MQ, Nunley JA. Long-term functional outcomes after operative treatment for intra-articular fractures of the calcaneus. J Bone Joint Surg Am. 2009 Aug. 91(8):1854-60. [Medline]. Calcaneus fractures. Comminuted fracture of calcaneus sustained in motorcycle accident. Note loss of Bohler angle. Calcaneus fractures. 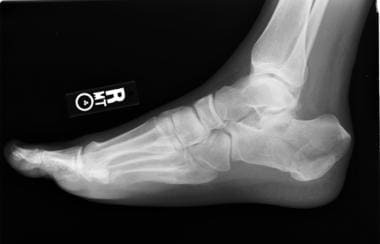 Axial radiograph reveals comminuted fracture of calcaneal body. Calcaneus fractures. Bilateral calcaneus fractures sustained in motor vehicle collision. Compare minimally displaced calcaneal tuberosity fracture on patient's left side with comminuted intra-articular (Sanders type III) fracture on right. Disclosure: Received consulting fee from Stryker Orthopaedics for consulting.